The uniformity within this record is comparable to the last in terms of both conception and execution. Yet Modern Lore isn't merely more of the same as the last record, if only because right from the start of "The Ramble," Lage, bassist Scott Colley and drummer/vibraphonist Kenny Wollesen exude such a bright confidence through their interaction(s). Such fluidity shouldn't be any surprise given their history together in the studio and on the road, but it's a rare virtue and not one to be taken for granted. Nor is the production expertise of Jesse Harris who also oversaw the preceding record. Whether the group is moving at a sprightly pace or at the more measured tempo of "Atlantic Limited," the sound of the instruments, individually and collectively, comes through without clutter. And to whatever extent Harris was involved in determining the track sequence of this album, he deserves abundant kudos for his fine ears and objectivity: even as each successive track unfolds in great detail, the sense of growing momentum is unmistakable. That sensation may, in fact, be grounded in the almost subliminal sound of Harris' Casio on "General Thunder," not to mention the similarly-nuanced keyboard additions of Tyler Chester. On a half-dozen of the eleven cuts that comprise Modern Lore, "Splendor Riot" or "Pantheon," to name just two, the latter doesn't so much make room for himself as find a place for himself in the arrangements. And that's not too fine a distinction to make because he impact of the sparse sound also becomes more resonant through the relative brevity of the recordings: the economy Lage, Colley and Wollesen share is particularly notable on the two-minute fifteen seconds of "Earth Science" where the core trio formulates a complete statement in remarkably short duration. 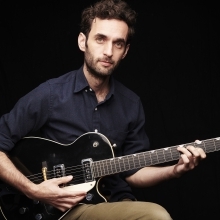 Although he's never merely workmanlike in his playing or writing (he composed all the material on the album), Julian Lage is too understated a musician/composer to literally grab attention. Rather, he entices a listener with the warm incisive fingerwork on his Nachocaster (sic) and piques the curiosity, during a track like "Wordsmith," slowly and inexorably. The quietly dramatic result is altogether similar to the effect rendered by the deceptively simple front cover art of Modern Lore: initially cursory examinations yielding to a firm, unwavering hold on the observer in very short order. Likewise, this music, as with the entire body of work by the guitarist to whom it's credited, holds the potential for consistently rewarding listening over an unusually extended period of time. Track Listing: The Ramble; Atlantic Limited; General Thunder; Roger The Dodger; Wordsmith; Splendor Riot; Revelry; Look Book; Whatever You Say, Henry; Earth Science; Pantheon. 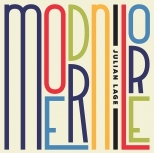 Personnel: Julian Lage: guitars; Scott Colley: bass; Kenny Wollesen: drums, vibraphone; Tyler Chester: keyboards; Jesse Harris: maracas, casio, acoustic guitar.